Natural water sources are in short supply within easy walking distance from where I live, so I got the idea a couple years ago to put together a couple of water barrels to create a little backup supply for plant watering and other non-potable uses. Well, it's been an off-and-on effort, but I finally came across a simple rubber water diverter and intake connection inserts that struck my fancy. I now have two water barrels up and running, and plan to add a third that feeds off the overflow from the back porch barrel. 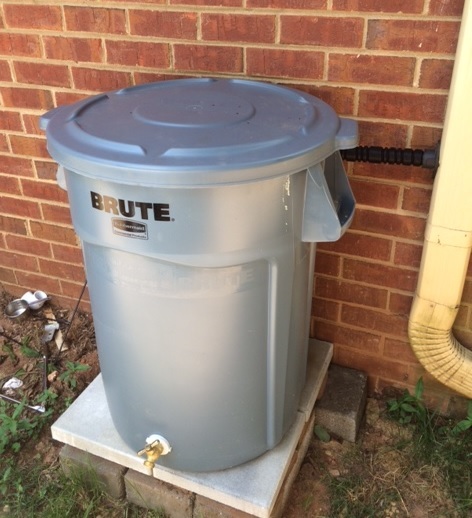 For those not initiated in the ways of water barrels, clean rainwater can be kinda dirty by the time it rolls off a roof and down a gutter and downspout. That's why I stress the water barrels are intended for non-potable purposes.